I am a fan of The Who. And by “fan” I mean I really liked the song “Teenage Wasteland” when it played in The Girl Next Door (2004), and casually enjoyed Tommy (1975) one time when I was younger. I am, however, an avid fan of documentaries, and certainly enjoy those made about musicians. A good music documentary will make you crave the band’s music during and after watching, even if you had never previously listened to them. (For me, this was Brian Jonestown Massacre, featured in Dig! .) Lambert and Stamp has many promising components to it, but unfortunately remains uninspired and flat. Really, the documentary is less about the forming of The Who, and more the two aspiring filmmakers that molded and managed them, Kit Lambert and Chris Stamp. Both had a penchant for the French New Wave trend, but struggled to find a way to break into the filmmaking business. Their solution was to find an unknown band, manage them, and film the entire process. The archival footage of their discovery and The Who’s early years are where this documentary really shines. In fact, the film would most likely be ten times more interesting if it was the actual film made by Lambert and Stamp, instead of about them making the movie. Sandwiched between the rich segments of The Who playing performing at the time they were discovered (when they were still called The High Numbers), and impressive interviews with a multi-lingual Kit Lambert, there are countless present day talking heads. Unfortunately, not the good Talking Heads—just interview after interview with those still alive: charismatic Chris Stamp, Pete Townshend, Roger Daltrey, and a few other people integral to the band. There isn’t anything inherently wrong with these interviews, aside from the fact they begin to all blend together. These segments are not at all aided by the bland set up, and arbitrary, occasional switch to black and white for current day. The archival material makes this a must-see for any major fan of The Who, or anyone curious to know their origin story. For anyone else, it’s a mild mannered doc that runs about forty minutes too long. 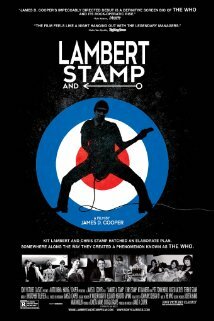 Lambert and Stamp opens in Philly area theaters today. Thanks for the review. I didn’t even know this was out. I agree with you about documentaries on great bands, one of those being “Don’t Stop Believing” on the quest for Journey members to replace Steve Perry. Also the docu called “Searching for Sugarman” is excellent. Would love to see your list!